The Renault FT is a French tier 1 light tank. The vehicle entered service in 1917, with 3,177 vehicles manufactured by the end of World War I and 3,800 vehicles produced in total. At the beginning of World War II, a total of 1,560 vehicles were in service. 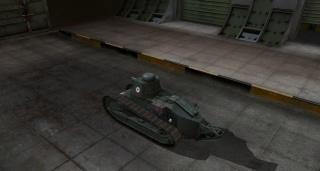 The first French tank available to the player, and is the oldest tank in the game. It has good acceleration, but poor top speed. The available guns have only subpar damage output, but a very high rate of fire. The armour is fairly thick for its tier. 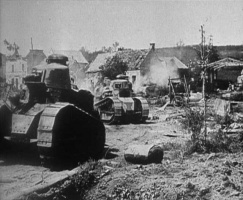 The Renault FT leads to the Renault FT AC, the Hotchkiss H35, the Renault FT 75 BS, the D1, the Renault R35, and the FCM 36. The FT can play out its strengths on maps with more narrow sections, where you can essentially be a roadblock for enemy tanks. Something to note is that the gun elevation is as good as the T57, but the gun depression is very poor (i.e. it's good at shooting up, but bad at shooting down) with the 37mm Canon. The 37mm Canon APX SA18 is only decent, as it has poor penetration, especially for a single-shot cannon, but partially makes up for it with its high rate of fire. The only other option is the 13.2 mm Hotchkiss mle. 1930, which can deal a large amount of damage in a short amount of time but pays for it with its effective range (it can only damage targets up to 400 meters away) and even worse penetration. The armour of the FT is fairly good, especially its turret, which is thick and rounded at the edges. 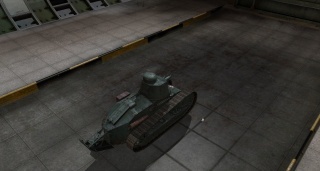 One can try to go "hull-down" with this tank, though the poor gun depression with the 37 mm can make this difficult. Simply get the second gun. 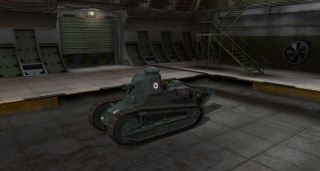 The FT was the ancestor of a long line of French tanks produced by Renault: the FT Kégresse, the NC1, the NC2, the Char D1, the Char D2, and the R35. (2, 3) It inspired and influenced many later designs by other manufacturers including the H35 and the Somua 35. (4) In addition to its pioneering design, the FT proved to be both cheap and suitable for mass production techniques. It became a popular export for France and Renault and was also licensed and copied for production by other countries. 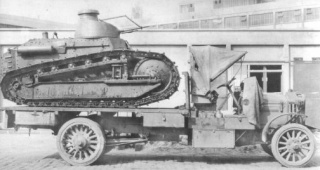 In the U.S., a slightly modified version was built under license from Renault as the Six Ton Tank, or M1917 (of which 950 were built, 64 before the end of WWI, but too late to be used in action). The Italians produced as their standard tank the FIAT 3000, a moderately close copy of the FT. 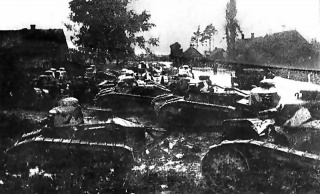 The Soviet Red Army captured fourteen burnt-out Renaults from White Russian forces during the Russian Civil War, and rebuilt them at the Krasnoye Sormovo Factory in 1920. Nearly 15 exact copies, called "Russian Renoe" were produced in 1920-1922, but due to technical production problems, they never actually saw the battlefield. 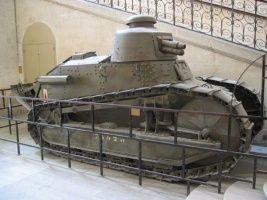 In 1928-1931 the first completely Soviet-designed tank was the T-18, a derivation of the Renault with sprung suspension. 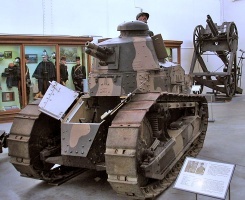 In all, the Renault FT was used by the armies of Afghanistan, Belgium, Brazil, the Republic of China, Czechoslovakia, Estonia, Finland, France, Nazi Germany, Iran, Japan, Lithuania, the Netherlands, Poland, Romania, the Russian White Army, the Soviet Union, Spain, Sweden, Switzerland, Turkey, Norway, the United Kingdom, the United States and the Kingdom of Yugoslavia. Studies on the production of a new light tank were started in May 1916 by the famous car producer Louis Renault. The evidence strongly suggests that Renault himself drew up the preliminary design, unconvinced that a sufficient power-to-weight ratio could be achieved by the medium tanks requested by the military. One of his most talented designers, Rodolphe Ernst-Metzmaier, prepared the final drawings. Though the project was far more advanced than the first two types of French tank, the Schneider CA1 and the heavy Saint-Chamond, Renault had at first great trouble getting his design accepted by the head of the French tank arm, Colonel (later General) Jean Baptiste Eugène Estienne. 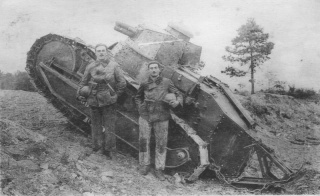 Even after the first British use of tanks, on 15 September 1916, when the French people called for the deployment of their own chars, the production of the light tank was almost cancelled in favour of that of a superheavy tank (the later Char 2C). However, now with the support of Estienne and the successive French Commanders in Chief, who saw light tanks as a more feasible and realistic option, Renault was at last able to proceed with the design. The design remained in competition with the Char 2C until the very end of the war. The prototype was slowly refined during the first half of 1917, although the FT was plagued by radiator fan belt and cooling system problems throughout the war. Only 84 FTs were produced in 1917 but 2,697 were delivered before the WWI Armistice. At least 3,694 FTs were produced in total, perhaps more; some estimates go as high as 4,000 for all versions combined. A total of 3,177 were delivered to the French Army; 514 were directly delivered to the U.S. Army; 24 to Great Britain; and three to Italy - giving a total production number of at least 3,694. The first FT tanks had a round cast turret; later improvements consisted of either an octagonal turret or an even later rounded turret of bent steel plate (called the Girod turret, after one of the factories that produced it). The latter two turrets could carry a Puteaux SA 18 gun, or a 7.92 mm Hotchkiss machine gun. 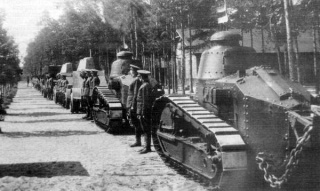 The FT was widely used by the French and the US in the later stages of World War I, after 31 May 1918. It was cheap and well-suited for mass production. It reflected an emphasis on quantity, both on a tactical level and strategic: Estienne proposed to overwhelm the enemy defences using a "swarm" of light tanks, and the Entente was thought to be able to gain the upper hand by outproducing the Central Powers. A goal was set of 12,260 to be manufactured (including 4,440 of the US version) before the end of 1919. 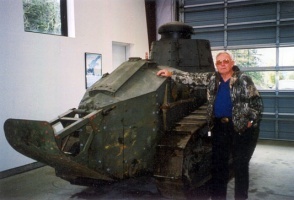 After WWI, FT tanks were exported to many countries. 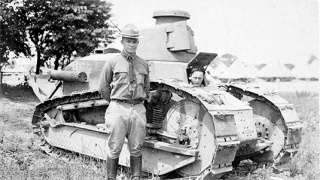 As a result, FT tanks were used by most nations having armored forces, invariably as their first tank type, including the United States. They took part in many later conflicts, such as the Russian Civil War, Polish-Soviet War, Chinese Civil War, Rif War, Spanish Civil War and Estonian War of Independence. 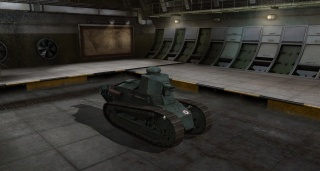 FT tanks were also used in the Second World War, among others in Poland, Finland, France and Kingdom of Yugoslavia, although they were completely obsolete by then. In 1940 the French army still had eight battalions equipped with 63 FTs each and three independent companies with ten each, for a total strength of 534, all with machine guns. 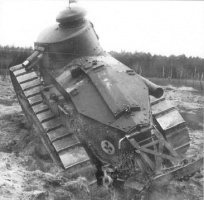 Today, approximately 41 Renault Ft survive, in addition to two Russian-built copies known as Russkiy Renos, three FT TSF command tanks, and twenty American-built M1917's. 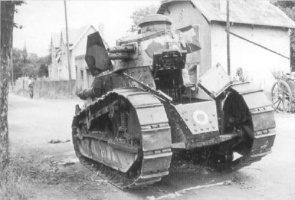 A plan to re-arm the Renault FT with the 25mm Raccourci, dating to 1933. 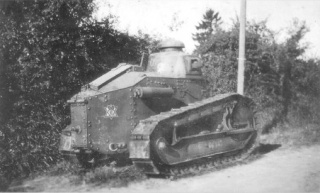 This would later re-surface in 1939 as the Renault FT AC. * The Renault FT never mounted the 13.2 mm Hotchkiss mle. 1930. The machine guns it was equipped with were the 8 mm Hotchkiss M1914 machine gun and the Reibel 7.5mm machine gun, both of which aren't available in game. The FT could not go faster than 7.7 km/h. Bingham, J., 1973, AFV Weapons Profile 58 - French Infantry Tanks Part I (Char 2C, D and B) , Profile, Windsor, UK, 24p. Bingham, J., 1973, AFV Weapons Profile 59 - French Infantry Tanks Part II (including R 35 and FCM 36) , Profile, Windsor, UK, 24p. Regenberg, W. and H. Scheibert, 1997, Captured French Tanks Under the German Flag, Schiffer, Atglen, PA, 48p, ISBN:9780764302657. 1917 Char Renault FT Web page at Chars-Francais.net. Photos, specs, and brief history in French. Renault FT-17 Light Tank (1917) Web page at the MilitaryFactory.com. 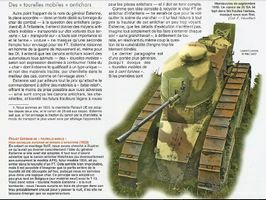 Renault FT Web page at Tanks-Encyclopedia.com. This page was last modified on 29 May 2017, at 20:55. This page has been accessed 132,330 times.